I’m a huge believer in the power of making lists. Creating a list is a powerful tool that will help you see things clearly. Making a list forces you to think and allows you to see the big picture. If you try to create new ideas, you would be wasting brain power on remembering your ideas. Plus, you can’t organize and simplify the information the way you can when using a list. Tips for Creating Great Lists! Below are a few tips that will help you build great lists. These tips don’t apply to all list types, (e.g. a shopping or to-do list, a fairly simple list that doesn’t require a lot of time) but are very helpful when it comes to lists that are for new ideas, planning, and changing the way you feel about someone, something, or a situation. 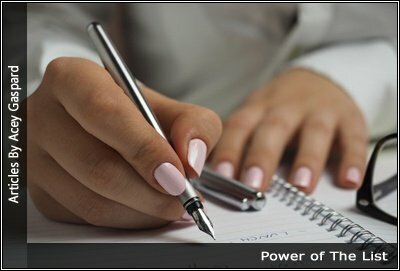 You can use a pen and notebook, your favorite word processor, your phone, cue cards etc. It doesn’t really matter what you use, as long as it works for you. I like to use word processors, because it’s easy to print, up-to-date, and store. Take the time to make your list. A good list requires time and thinking, so don’t rush it.Â You can make your list in stages. You can start today, tomorrow, or the next day. This gives you time to reflect, gives your mind time to come up with more ideas. Once you’re done building your list, you could also do some research online to see if there are any new ideas, something you might be missing. a.) Take 15 to 20 minutes to complete this exercise. b.) At the top of your list, write down your list topic. c.) Write numbers from 1 to 20.
d.) You’re not allowed to get up unless you finish the 20 items on your list. When you do this, you’re forcing your brain to come up with ideas. You may experience that the first few, say from 1 to 9, will come to you easily. When it’s time to come up from 9 to 20, you may find you’re really struggling, but these are the gems for your list. These are the things that really get your mind digging to come up with great ideas. Keep in mind, you can adjust the numbers from 1-20. It can be from 1-10, 1-15, etc. The longer your list, the more your brain has to dig, and the more digging, the better the ideas. Sometimes you won’t always need your list. You may need it a week from now, or a year from now. It’s a good idea to store your list in one place, where you can always access them. Make building a list a habit, and you’ll experience how much your organizational skills have improved, and the number of ideas you can come up with.